From the Great Lakes to small inland lakes and everything in between, there are many things to consider when using public waterways for tow sports, but one of the most important concerns is the shared use of that waterway. Early one morning, I was out skiing in a slalom course with some friends, taking advantage of the nice, calm water. Undisturbed water is important for both skier performance and safety. As we were making our pass though the course, another boat entered the bay towing a massive, three-person inflatable tube in a completely random pattern. I tried to power through their rolling waves, but they got the better of me. My immediate reaction was to give that driver a piece of my mind, but I decided to take the high road to see if they understood how we could both be using the water at the same time. We idled over to their boat and politely introduced ourselves. I then asked the driver if he would mind taking the tube to another part of the bay around the corner that would have little to no impact on our course. He had no idea their boat waves were having any effect on our skiing and willingly agreed to stay over in the other bay. This got me thinking it might be time for a refresher on sharing our waterways with multiple tow sports enthusiasts. Drivers, first and foremost be aware of your surroundings. Before hitting the throttle, look around to see if what you are about to do is going to affect other people on the lake. The boat’s pattern has a direct effect on the river, bay or narrow waterway. If your boat runs parallel to the shoreline, the rollers will hit the shore and eventually dissipate. If a boat runs perpendicular to shore, the waves will run the entire length of the bay, making it difficult to drive and enjoy consecutive passes. When waterskiing, the best boat pattern to take is a straight line followed by a keyhole shaped turn sending the boat and skier back down their own wake. This pattern will create perpetually calm passes in a controlled area allowing multiple skiers following this same pattern to cohabitate nicely on a single lake. 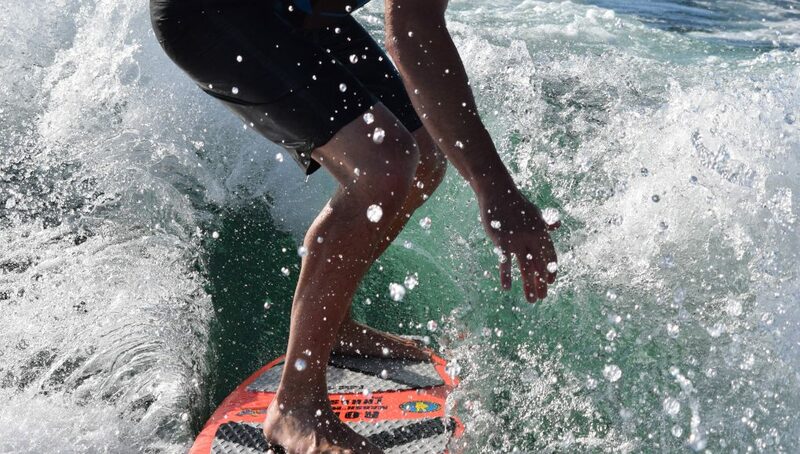 If you are wakeboarding and/or wake surfing, what effect will your monster waves have on the other people in the bay? The same driving rules as above apply to both disciplines; however, when your rider falls, idle back instead of making power turns. You have to slow down anyway so take your time and you will leave less of a mark in doing so. As surfing continues to take the world by storm, it’s important that you choose your riding spots carefully. The waves generated are massive so be aware of how they are impacting those around you. Mixing up your riding spot is a great way to minimize the effects on the same people all the time. I love bashing my kids and their friends on the tube of death as much as the next guy, but inflatables are last in line when it comes to needing calm water. They can be towed in just about any water condition. If there is someone else in your general vicinity skiing or boarding, let them have the calm water and tow your inflatable in another area. It’s just the right thing to do. When towing your tube, give yourself lots of space and be well aware of the radius you need to safely swing the tube around. On large lakes there is no shortage of space, so it’s easy to find your own stash of calm water to have some fun. When the lakes are smaller that’s when you really need to respect the waterways so everyone can have their turn. This article is featured in the Fall 2016 issue of Boats&Places.